Wilson and I never forfeit an opportunity to have a special brunch on the weekends. But one thing that’s so great about breakfast is that the food can be incredibly good without being terribly difficult or time consuming to prepare. 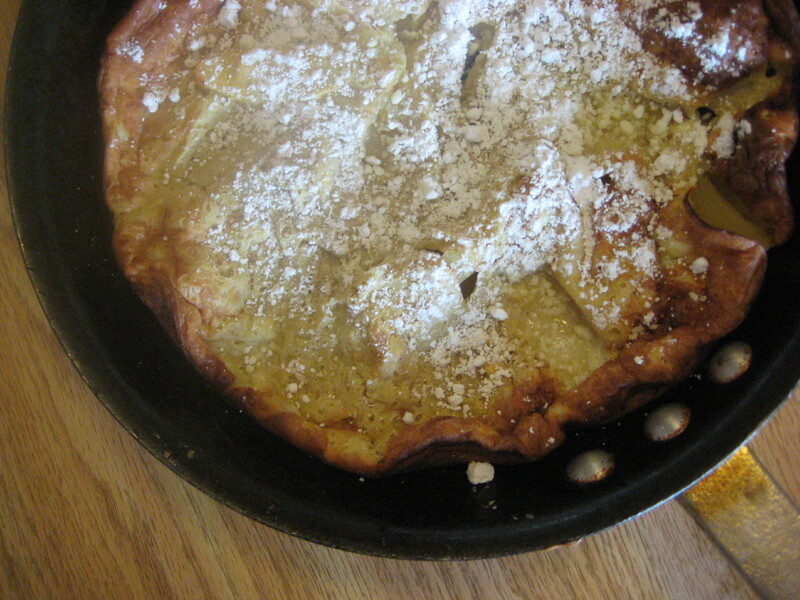 Enter this big apple pancake. It’s sort of like eating a pancake but also sort of like digging straight into a hot apple pie. All the pancake requires is roasting apples in butter for a short while and then topping with batter before returning the skillet to the oven. The pancake gets incredibly puffy in the oven and deflates shortly after it’s removed. Nevertheless, it’s quite beautiful in its own homey and slightly mangled way. We call that kind of food “rustic” in our kitchen. Looks aside, this breakfast has plenty in the realm of personality and flavor. The baked apples are as good as you can imagine and the pancake component surprisingly light. 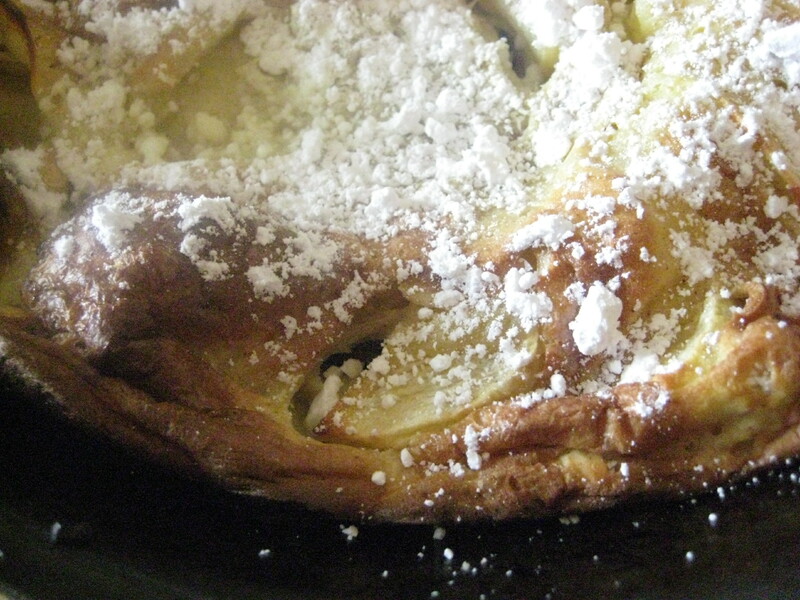 We served the pancake with a dusting of powdered sugar and real maple syrup. I mentioned the dish to my mom and she piped in with the suggestion: “You should try adding whiskey to the maple syrup next time – whiskey and apples go great together!” A little older, a little wiser, I guess. I can’t wait to make it again! Melt 2T butter in skillet over moderate heat. Add apple wedges to skillet and cook in the oven, turning over once, until beginning to soften, 3 to 5 minutes. While apple is cooking, add remaining 2T melted butter, milk, flour, eggs, granulated sugar, vanilla, and salt to a bowl and mix until smooth.